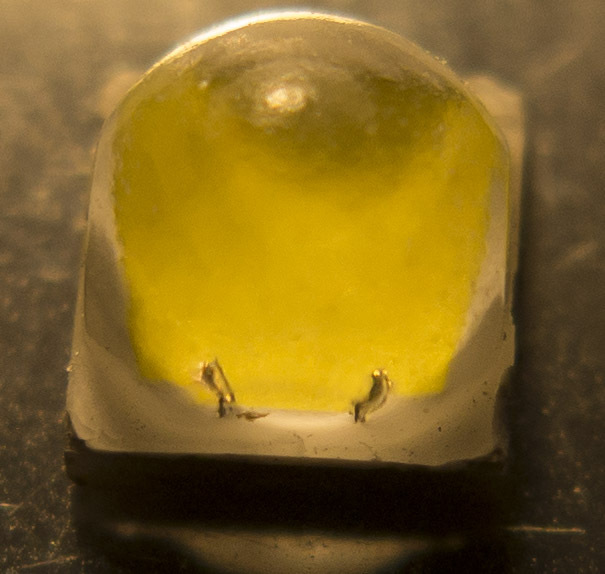 With the low forward voltage, it would seem this should be a great led for regulated multi emitter lights. Its not a lot less watts, but over several emitters it adds up. Less heat, slightly more run time. Sounds good to me. Hmm, if somebody made a mcpcb for these in a 20mm triple……… With a fet driver could be interesting as well if they push that much easier than xp-g3’s do. After checking my Ali sst-40s I realized they are b grade, half have bubles in dome and some are not square but wider and centering dics not fit them. KD is better place to buy, better bin, higher price though. After checking my Ali sst-40s I realized they are b grade, half have bubles in dome and some are not square but wider and centering dics not fit them. KD is better place to buy, better bin, higher price though. Were your LED’s mounted on mpcb’s? or were they bare. I’m still contemplating getting a few of these. I think those shops on aliexpress did not sale bare leds only with mcpcb at least there were no bare leds where I bought them (SST-40). Well, i bought 2 SST-40 form AliExpress, and i put them in pure toluene.. So it died in the toluene, but i almost managed to reflow the chip back on the 5050 base, but something went wrong, it didn’t work anymore.. Interesting discovery though, because i think you could reflow the chip directly on to copper, and find a way to connect the bond wires to ‘something near by’, improving the thermal path from chip to whatever copper you want. But i’m not buying them from AliExpress anymore. It seems they are factory rejects. The second survived the ordeal, it is dedomed now. But i was afraid the bonding between chip and phosphor would dissolve, like someone described happening earlier in this (or another) thread. So i will try solving at higher temperatures with the 2nd SST-40, see if i can get it totally clean. Meanwhile i have one from KD too. I got 1 half way decent one out of like 30, decent that the bond wires didn’t break, but still, silicone remains are hanging off the bond wires. All of the SST-40’s I got came from Kaidomian. I have 20 SST-40 N4 AD’s coming 12 of which are going to replace the XML’s in my TR-J20, the rest, I’ll try a different approach. I think I have read that having little silicon left on the bond wires is just good because it protects them. Not if you can see it in the beam. I think 18sixfifty has had some success, from what I gather, he slices and dices before chemical de-dome bath/soak. The silicone dome has a heck of a hold on them bond wires. I have also had the chip coming off the pad on a few of them too! Do post your build, I’ve got 2 of them and thought they needed a boost. Boost it’s pulling 8 amps on a VTC5A, I thought I had something wrong at first, cause it would only pull 6+ amps, until i put a fully charged VTC5 and then a tried a VTC5A . I just swapped out the emitter/board in my M25C2 Turbo that had a FETDDdrv. in it. It’s a pretty intense BLUE-ISH spot, just kinda fuzzy and dark to one side, like casting a shadow from the silicone clinging on. Meh, I live with it, because I know what will happen! Dales shaves them down to just above the phophorus and he’s getting like 9.4amps or more 2400-2600 lumens, something like that. Maybe or could be, if they are weak, they might be damaged, I had a few that would light, go thru the levels a couple times and then burn out, some instantly and they still had the dome on, it was released from the base just not completely off, so I’m left wondering, was it the bond wires or was it the chip to the pad problem? Dunno? Wow, even some of those from KD have badly solder flowed chips?? There’s no way the solvents cause the chips to fall off i.m.o. On mine you could see it wasn’t soldered properly. Whoa, that sounds like the KD ones are from a crappy batch too..
Got my SST-40s from Shenzhen Great Technology Co.,Ltd, they appear legit. Anyone know if I can use Sony vtc5a on my fenix TK75 quad modded with sst-40? Sure but If you want the full power, you should mod the carrier. Funny, it appears renamed to “GreatLED Store”. I forgot to mention the carrier is modded., will post photo tonight.. I just want to know if Sony vct5a are safe with sst40. Ok here is my fenix tk75 quad sst40 dedome. Is Sony vtc5a safe to use in this light? It’s possible you will blow the bond wires from too much current (~9.5A) if it’s direct drive and low circuit resistance. What is the voltage configuration and driver? And have you used other cells in the light successfully? I think Newlumen’s light is modded by Vinh , with “driver vnx2” which is a fet driver . Yes sir. The tk75vn is modded by Vinh. Probably drawing 4.5 amp from each cell.. the Carrier is 4S.. I like using Sony vtc5a. So far I have no problem using the highest mode with my vtc5a. Either way, if the light break, he said he will fix it for free.. so I don’t worry much.. It draws about 8-9 amps per cell . Please advice from those who bought SST-40 from Aliexpress store called GreatLED Store, that it was called Shenzhen Great Technology Co.,Ltd. Anyone knows if there are higher bins available somewhere? Thanks! I think I read in Richard’s thread that he asked about other tints/bins but that Luminus thusfar only made a few types at all. I ordered two from there. I couldn’t make out any flaws in the domes of the ones I received. I put one in a direct-drive light. I haven’t done any rigorous tests, but I can say that it puts out a lot of light and runs relatively cool. I built a similar light in an F13 host, with a 26650 battery, but I used an SST-40 emitter on a DTP copper MCPCB I bought from Kai domain. I’d estimate they have similar performance, but the one from KaiDomain is slightly warmer, as expected. What is the best forward voltage bin for this led for flashlights with the A17DD or X5/X6-driver? As giorgoskok wrote, the sst-40 specs from aliexpress store: Shenzhen Great Technology Co.,Ltd. 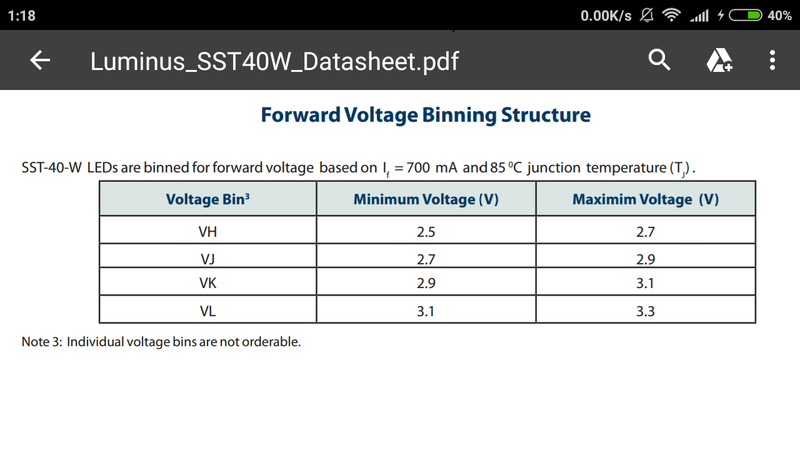 You see that there are 2 bins lower then the VK bin and I guess if you use those with DD-FET driver you get more Amps (if I understand this correctly) then the VK bin but that means more heat. Are those VH and VJ bins better (more Amps = more light) or are they so good they get worse (to much amps = to much heat and the led burns)? KD has VH Voltage binned SST-40’s now. Has higher brightness bin too.